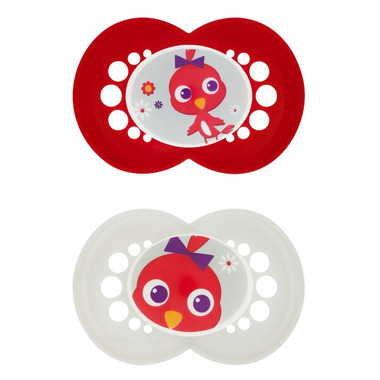 This BPA-free Cartoon MAM Pacifier was developed by leading pediatric dentists and developmental psychologists to provide maximum comfort and style for babies 6 months and up. MAM’s cutting-edge pacifiers combine technological innovation and trendsetting design to help give babies a healthy start in life. Includes 2 BPA-free MAM Cartoon Pacifiers. My 5-month old is pretty picky with soothers. She seems to like this brand. I like that they come in microwave sterilizing boxes which is super convenient. I don't like that they have a "easy grab button" because they don't really work on the pacifier clips I had so I had to buy a pacifier pod.